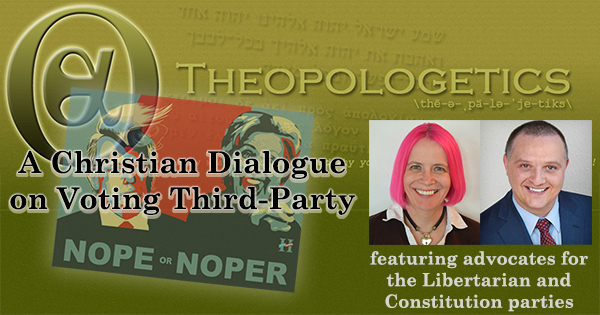 Two of my Christian friends, Caryn Ann Harlos (aka Dee Dee Warren) and Christopher Ray, join me to discuss third-party voting options in an election in which many disaffected Christian Republicans cannot countenance voting Republican or Democrat. This episode contains part 4 of our four-part discussion. Two of my Christian friends, Caryn Ann Harlos (aka Dee Dee Warren) and Christopher Ray, join me to discuss third-party voting options in an election in which many disaffected Christian Republicans cannot countenance voting Republican or Democrat. This episode contains part 3 of our four-part discussion. Two of my Christian friends, Caryn Ann Harlos (aka Dee Dee Warren) and Christopher Ray, join me to discuss third-party voting options in an election in which many disaffected Christian Republicans cannot countenance voting Republican or Democrat. This episode contains part 1 of our four-part discussion. Dr. Michael Brown joins me to discuss the gay agenda, homosexual activism and his book, A Queer Thing Happened to America.